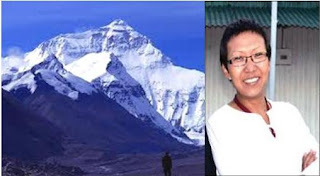 Kohima, Jun 20 : Nagaland government will on Thursday felicitate Major Neikhrietuonuo Linyu, the first Naga to conquer Mount Everest, at Raj Bhavan in Kohima. According to the programme, Governor Nikhil Kumar and chief minister Neiphiu Rio will address the gathering in which a presentation will be made by Linyu, a doctor with the Indian Army. Part of the Indian Army mountaineering team that which included four women officers, Linyu scaled Everest on May 25 becoming the first Naga woman to record this feat. At present, she is posted in Agra and in the past has been a part of the UN peacekeeping force in Congo. Neikhrietuonuo, daughter of Pelhousenyu Linyu and the eldest among five siblings, did her schooling from Don Bosco higher secondary school in Kohima and went on to complete MBBS from RIMS, Imphal after passing her PU from Science College, Jotsoma. She is. The expedition was carried out through South ( Nepal) which is known as the traditional route, from which Sir Edmund Hillary and Tenzing Norgay had first climbed the peak. Earlier, Nagaland CM Neiphiu Rio congratulated Linyu and observed that the achievement is a landmark for the state and her feat should inspire Naga youths to strive towards excellence to bring glory to the state and the country. He also said that her achievement should be particularly inspirational for Naga women and proves that our youth and women are capable of reaching the highest standards in the international arena.